Use this blend on meats, chicken, fish and vegetables. It's a great addition for soups, salads, sauces and gravies. It is absolutely the best on corn-on-the-cob and all you'll ever need for seasonings in your Bloody Mary's! This is the ultimate camp and home kitchen accessory. Our family has been avid campers for over forty years. Prior to a trip, many years ago, Tom, wanting to conserve space in the kitchen supply box, mixed the contents of various seasoning bottles (in a measured way) in one bottle. 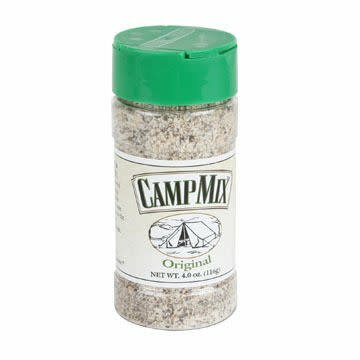 After we set up the camp kitchen, he simply told everyone that if they wanted any kind of seasoning that they could find it all in that one bottle. Well, by the end of the weekend...people were literally trying to steal the bottle to take it home. And, as happens when our crew gets together, arguments ensued as to what we had to name this new concoction. CAMP MIX ended up being the clear winner. Over the years, the "word of mouth" thing created a demand that not only created a mini personal gift giving hobby for Tom, it verified and solidified that he had a real product. Pushes became shoves and Tom decided to give it a go and make his homemade "stuff" a marketable product. 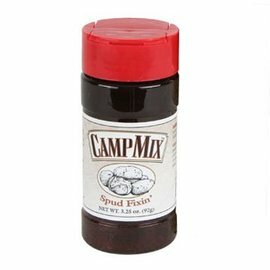 So was born...CAMP MIX!"